Another week, another Thursday game! That just means more Moneyball contests for us to enjoy, so jump inside and check out this week’s tips before pumping the Match Committee podcast from Thursday night. When these sides met earlier in the season, Tom Mitchell followed his namesake Sam around and held him to a mere 49, his lowest score for the season. Horse isn’t about to let that tactical advantage slide, so expect to see Sam Mitchell ($8,800 MID) copping a tag from another Mitchell for the second week running after Kane did the job to the tune of 87 MB last weekend. All the signs point to letting Sam slide through to the keeper this week. Whatever you do, avoid Cal Sinclair ($5,800 RU) like he’s got polio and vaccines haven’t been invented yet. Unfathomably, he’s only managed pedestrian scores of just 54, 48 and 36 since Tippett went down. I didn’t think it was possible, but he’s getting worse each week. I’m shocked he’s even playing tonight, to be honest. While we’re on the subject of ruckmen, take a long look at Jon Ceglar ($6,500 RU) tonight. He stepped up last week after I recommended him last Friday, notching his penultimate score for the year of 93 MB. He now fronts up against Sydney, whose rucks have bled points ever since Tippett was crippled. Ceglar should be value for money, even if he can’t hit those triple-figures that the other big-name rucks manage. Join the $10,000 guaranteed Swans vs Hawks Special here! Callum Mills ($5,600 DEF) has been quietly ticking along with scores of 87, 82 and 92 as he mounts a Rising Star-calibre season. He’s seeing a jump of about 20% in key stat areas over the last month compared to his first 9 games this season, and there’s no reason to think that won’t continue this week against the Hawks. Just don’t call it a comeback! Luke Hodge ($8,400 MID) is back with a bullet, scoring 110 and 125 since returning from a long list of ailments. He’s slotted straight back into that tasty quarterback role for the Hawks that he’s been known for over his career, and that’s been a catalyst in Hodge plucking 19 marks over the past fortnight. Patrick Dangerfield ($10,800 MID) was crazy good last week, particularly early when he amassed 18 disposals in the opening quarter. However, that high velocity scoring slowed dramatically once Sydney paid him due respect and that’s my primary concern with Danger. Michael Barlow ($8,800 MID) is back this week and Dangerfield is a big juicy cut of prime tag target beef. While you can rest easy knowing Patty which likely reach three figures no matter who runs with him, realistically, his price is so high that if he’s not hitting 140+ then you’re overpaying big time when there are $8k players capable of similar winning scores. 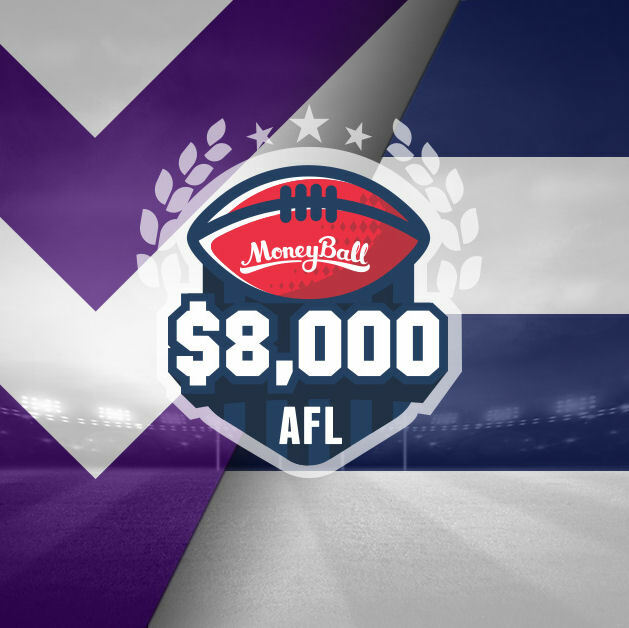 Check out the $8,000 guaranteed Dockers vs Cats Special here. From a negation perspective, I’m also tentative on Lachie Neale ($9,200 MID). As we know, untagged, Neale is a beast and he’s thrown Fremantle onto his shoulders on more than a few occasions this year. But when he’s tagged, he’s produced cornflake-spitting scores of 55, 68 and 83 in MB. Ultimately, whether Blicavs is given a defensive role (as he was in R7, R10) is the deciding factor here. My gut says that Geelong will back themselves to dispose of the purple haze without resorting to individual blacklisting, but just be aware that the possibility is there. So Jon Griffin ($5,600 RU) wasn’t great last week but we have to take into account that he was locking horns with ruck’s heir apparent in Max Gawn. I’ve looked at him again but unfortunately, Geelong are one of the worst teams for conceding points to rucks – thanks to taking a trio (Blicavs/Zmith/Stanley this week) of capable big men into battle each week. Still, Griffin was solid (though hardly spectacular) in the month before his most recent injury, and he’s cheap enough to hope that he might buck the trend this Friday night. It’s hard to go past Hayden Crozier ($6,500 FWD) until his price reflects his current output. The Croz started slow in Round 16, yet still ended on 89 MB in typical burst-fire scoring from a halfback distributor. He hasn’t let us down ever since he set anchor in the back half, ticking over at a hefty 95 points compared to a mediocre 62 MB as a forward previously. I’m assigning “lock” status here. Here are the undeniable facts; Peter Wright ($5,000 FWD) is cheap and in form, with scores of 98 & 142 in the past fortnight. However, they were against Saints and Lions respectively, two of the easiest teams to score fantasy points against as a FWD. The Bulldogs aren’t pushovers in that part of the ground and with the Suns missing their 5 nominally best onballers, the supply won’t be great for 2 Metre Peter this week. Save him for a more promising match-up. Speaking of match-ups, Richmond are the 2nd hardest team to score against over these past five weeks (closely trailing Adelaide), which isn’t good news for high-priced Dons like Merrett/Goddard/Kelly/Zaharakis. Avoiding Bombers across the board is a smart move where possible, unless you see obvious value that can buck the trend. Did you know that Matthew Broadbent ($7,100 DEF) is only 25 years old? Here I was assuming that he was squeezing a few extra miles out of his long career, but he’s actually a spring chicken on the fantasy rise. Broadbent has seen an uptick in production lately, registering scores of 92 and 126 in past two after moving from a backline role up onto the wing. Gamble on that continuing this week. One Crouch dips and another rises. While Matt has produced 70’s in the past fortnight, Brad Crouch ($7,400 MID) has been busy producing scores of 86 and 113 MB. He’s finally playing a full-time midfield role and he’s reaping the most obvious of rewards. We have a buffet of high upside picks on the menu this week, so let’s start with youngsters Jason Catstagna ($3,700 DEF) and Olev Markov ($3,500 FWD). TheTigers have been vocal is saying that they’ll be pumping minutes into these kids, who were great in Round 15 with 100 MB apiece. Coming up against Essendon, with great pricetags and the ability to snaffle them up in lower positions like FWD/DEF – what’s not to love? Pick this pair so you can spend big elsewhere. Next up is Dustin Martin ($8,800 MID), who is absolutely unstoppable at the moment with only the single score under 90 in the past 10 weeks – yet he still slots in at under $9k. Essendon, as we know, give up monster points to MIDs and Dusty should capitalise on some bruise-free footy. The centre bounce attendances rocketed back up last week for Aaron Hall ($8,200 MID), and a lack of Ablett/Rischitelli/Prestia should ensure that remains the case for the rest of the year. Hall’s worth a gamble based on the last time he lead Gold Coast’s midfield in a time of injury crisis, as he averaged 109 AFL Fantasy points in the last six games of 2015. Lastly we have the behemoth Todd Goldstein ($9,000 RU). Port has been bleeding the most points to rucks over the year, and it could get messy with a shark like Goldy feasting on the carcus. Goldstein posted 65 hitouts last week and that was against a capable Lycett – logic says he should obliterate Trengove in the air and only needs a handful of touches to manufacture a big score this weekend. While we’re on the topic of tags, Ed Curnow ($9,100 MID) applied one of his own last week but Sloane broke it (114 MB) convincingly. His hit list focuses mainly on contested players, so he should end up on Priddis/Shuey this week. Avoid that pair unless you’re sure as to which one will face the heat. Offensively, Curnow’s 91 MB was just his 2nd-worst score in his past 11 efforts. We’ve been pumping Ed up for weeks: he’s just a super consistent option and a worthy pick against a weak Eagles midfield. Are we really so desperate as to consider Jack Grimes ($6,300 DEF) after all he’s out us through over the journey? I guess that’s what happens when you return from the dead with a monster 143 MB score. Grimes’ obviously done enough to earn his second game for the year, but don’t expect this kind of output each week. For that price, and taking into account his history of Premium-type scoring, he might be worth a gamble against the leaky Saints… But it feels dirty. The Saints are back under the roof again, where Jack Steven ($9,500 MID) is a beast. While he averages a healthy 98 when not beneath The Roof, that improves greatly to 114 at Etihad. Encouraging, right? However, another way of looking at it is: Do you think the Saints can win on Sunday? In fact, he’s only exceeded 100 MB in one of St. Kilda’s losses. I was locking Jack in this week until I uncovered these worrying stats… Let me sleep on this one. Jeremy Cameron ($5,400 FWD) – kicked 8 goals in last fortnight, for score of 77, 80 MB. Jonathon Patton ($5,100 FWD) – 3 goals last week and cheap as chips. Toby Greene ($8,200 FWD) – has kicked 3+ goals in 7 games this year; always a threat. Scott Lycett ($7,600 RU) battled manfully against Goldy last week and crawled to 96 MB, despite being belted in the hit-outs 65-28. He’s had only one hiccup in recent memory, but 10/11 of his most recent games have been 86 MB or better… and he still sits under $8k? Yes please. Another obvious pick is his teammate in Andrew Gaff ($7,600 MID), who’s riding recent scores of 99 and 138 into Sunday’s clash. He’s great value now that’s he back to his ball-magnet ways, and he’s at his best when he’s being spoonfed the footy – his uncontested possession %’s over the past 3 weeks have all been season-highs. It might seem a little counter-intuitive (don’t we prefer it when they have high CP ratios, Tbetta?) but the uptick in uncontested footy means that Gaff is getting the pill on his terms – and that’s in a paddock of space.